The financial disaster of the 1890s helped to cast the fate of Washington’s two largest Puget Sound cities. One hundred and twenty-five years ago this summer, banks were collapsing all across America. The Panic of 1893 slammed into the four-year-old state of Washington like a typhoon, sweeping away puffball investments in streetcar lines, hotels and entire new towns. On Puget Sound, the cities of Port Townsend and Anacortes nearly died, and on Grays Harbor the town of Ocosta did. How the region’s two largest cities — really towns then — responded set the fate for each and poses a lesson for modern-day leaders. Bruce Ramsey will read from his book, "The Panic of 1893," at 6 p.m. Thursday, Aug. 16, at the University Book Store, 4326 University Way N.E., Seattle (800-335-7323 or ubookstore.com). The experience of the depression and the recovery from it was much different for Seattle than for Tacoma. In the years before the Panic, Tacoma had grown almost as big as Seattle, a second boomtown challenging Seattle for dominance on the Sound. Tacoma attracted the first railroad of any city on the Sound — the Northern Pacific — and the first big sawmill to ship its lumber east. 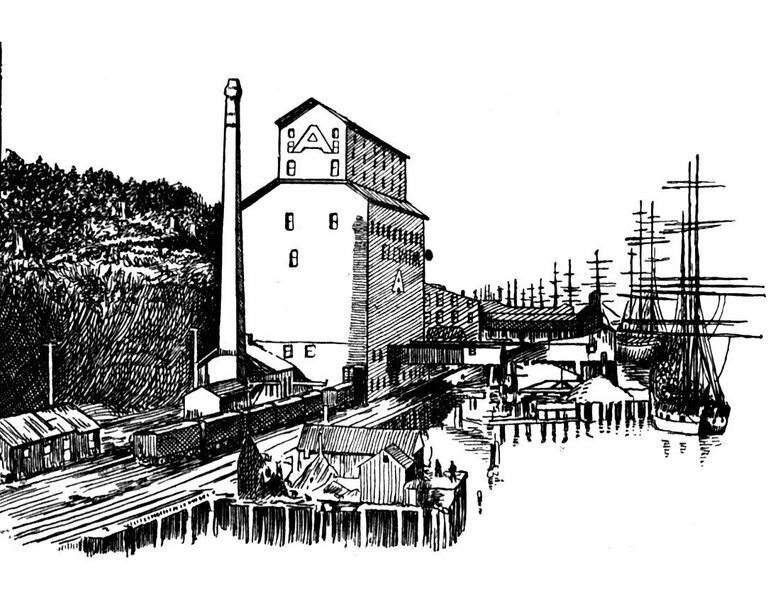 For several years Tacoma was Puget Sound’s only grain port and boasted the only regular steamship service to Asia. In the depression years, Tacoma fell behind. The first bank failure in the state was in Puyallup, and the first failure of a national bank was the Merchants National Bank of Tacoma. In Washington, Pierce County was ground zero for bank failures. It was also Western Washington’s hotbed of a new third party, the People’s Party. Its followers, called Populists, blamed the depression on evil bankers in New York and London. From my research, I came to the belief that its Populism was much of the reason why Tacoma fell behind Seattle in the 1890s. Populism was an angry, cynical creed — suspicious of bondholders, bankers, business leaders and successful people generally. It was particularly hostile to the immigrant Chinese. Apart from the racism, the thoughts and feelings of the Populists were eerily like the Occupy Wall Street activists of a few years back and of the “Tax Amazon” crowd that recently mobbed the Seattle City Council. The circumstances were different. The current struggle comes at a time when the city is flush, and activists feel the wealth is there for the taking. (It’s not their wealth, though, is it?) In the 1890s, the economy of Washington had been knocked into the ditch. The complaint then was not “inequality,” but stark and painful want — finding the next meal, and having enough fuel and clothing to keep warm. The similarity in the two cases is in the blame heaped on the business class, and a political campaign to make the job creators and the successful pay. Investors are the spark plugs of growth. Kick them in the teeth, and they go elsewhere. Your town falls back. Something like that happened to Tacoma in the 1890s. The books say Seattle surged ahead of Tacoma because Seattle took advantage of the Gold Rush to the Yukon — which it did. But why did Seattle make the most of the opportunity when Tacoma did not? The atmosphere in Seattle was different. The psychology was different. Seattle was more socially united and focused on the possible. Tacoma was focused on blame. The editor of the Tacoma Ledger newspaper complained again and again of the “croakers” and “calamity howlers” on Pacific Avenue spreading gloom and bitterness toward Tacoma’s bankers and its business class. Led by a judge of the Pierce County Superior Court, John Stallcup, Tacoma’s Populists pushed the city to default on its bonds, all the while Seattle proclaimed itself the city that always pays its debts. Tacoma had also driven out the Chinese a decade before, allowing only three Chinese to live there. While its race relations were far from perfect, Seattle made an effort to be cosmopolitan. It had a Chinatown and several Chinese merchants in the Seattle Chamber of Commerce. Tacoma eventually shucked off its Populist and anti-Chinese past. It never defaulted on its bonds. It resumed its growth, including trade with Asia. But in the 1890s it lost ground it never regained. Seattle is today the principal city in the state partly because 120 years ago it continued to support its business class, socially and politically. If it strays far enough from that, it risks being sidelined, becalmed, left behind. History shows that the impulse to bring down the successful may bring down a successful town. In resisting that impulse, the people of Seattle have helped to sustain their city.